Children need summer camp. Whether it is secular or religious, one week or several, day camp or residential, children need to participate in camp. I have no credentials to make this assertion. I am not a noted child psychologist or a Ph.D. in childhood development. I’m just a parent who has been to camp with kids. I’ve seen the advantages with my own eyes. My particular preference is an overnight camp away from home, and my experience is mostly with church camp, although I have volunteered at Cub Scout day camp. For the past four years I have chaperoned the third through sixth graders from my church at PassportKIDS camp at the Clyde M. York 4-H Center in Crossville, Tenn.
1. Unplugging. In this case, I mean literally. Parents have a sense that their children spend too much time in front of screens: television, computer, tablet, personal device, game system, etc. Unless it’s computer camp, kids have the opportunity to look up and see the world around them. They interact with each other, for good or bad, and learn how to relate to each other, solve problems and deal with the challenges of human relationships. They pay attention to their surroundings and notice details of the natural world that may have escaped them. They are more teachable and alert to possibilities and their potential for growth. 2. Moving. There is no better cure for summer coach potato syndrome than a good dose of camp. Kids are constantly in motion at camp, running, playing, competing, and even getting from place to place across the facility. Most of the recreational activities at PassportKIDS are creative games that don’t require athleticism. All kids need to do is commit to the activity and get in the game. Fun, not proficiency, is the goal. Sweating may produce a stinky suitcase and a cabin that could use generous quantities of Febreze, but that’s a small price to pay in exchange for burning calories and getting some exercise. 3. Cheering. Kids have nine months to use their indoor voices. At camp, they can let it all out, usually at the encouragement of hyped-up, over-zealous college students who seem to be fueled by Tony Stark’s Arc Reactor. It usually takes kids a little while to join in, but by the end of camp, the yelling and chanting and cheering have drawn out even the most extreme introverts. By selling out and rooting for each other and themselves, the kids tap into a source of self-confidence and selflessness that can cure narcissism, cynicism and several other “isms” that you don’t want your kids to have. 4. Listening. It’s nearly universal: kids at camp pay attention. When I am at home and have to get my kids to the dinner table, I have to repeat my instructions at least three times. When kids are at camp, they are more focused on what is being communicated. They hear you when you talk to them. They learn. They internalize truths so much more readily than when they are distracted by the noise and toys of home. If you don’t believe me, try being a chaperone one time. It will suddenly make you feel like the best parent ever. Kids listen at camp. 5. Being independent. This is the one point that my chaperoning may have impeded my children’s growth. When kids are at camp by themselves, they learn to get around, follow a schedule, keep up with their stuff, and generally take responsibility for themselves and each other in ways they can never do while a parent is hovering. I noticed this year at camp, rather than pick a bunk above mine or even near it, Barron picked the one at the opposite end of the room. He’s also had two summers of being at Boy Scout Camp on his own, and he’s found that he likes it. Children need to learn to make decisions for themselves, and as a parent, there is nothing more rewarding than seeing or knowing your child has made a good choice on his or her own. At camp when you’re not around, they have to make their own choices. Sure, they may come home with a fewer socks or towels, but that’s part of the learning experience, too. The next year, they’ll be more likely to keep up with their stuff. Camp may be over for this year, but I’ve already marked my calendar for next summer. I can’t wait to go with the kids from Parkway again and see the next generation experience the wonders of camp. What did you learn from camp? 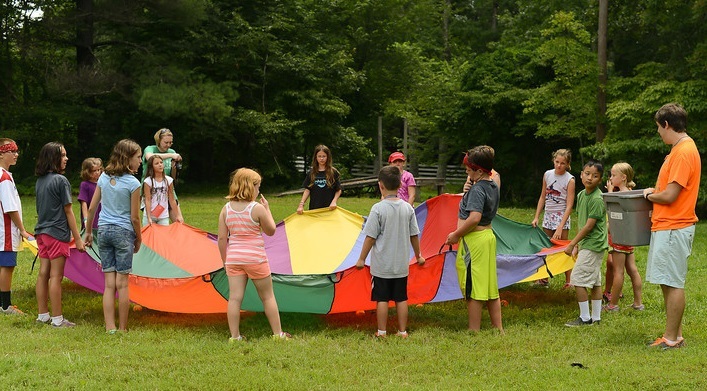 What are your fondest memories of camp? Did you have a positive or a negative experience? What do you think your kids get from their camp experiences? Leave a comment below or you can’t ride in my little red wagon…. Oompa, ooompa, oooompapa. This entry was posted in Uncategorized and tagged Boy Scouts of America, camp, children, church camp, contemporary South, day camp, family, Lance Elliott Wallace, Lance Wallace, New South, New South Essays, NewSouth, overnight camp, parenting, Passport camps, PASSPORTkids, raising children, raising kids, South, Southern, Southern Culture, Southerners, summer camp, the South. Bookmark the permalink. It’s also a place where you can get some delicious rolls. Great article. Your reasons are right on. I spent almost all of my school age summers in some kind of camp. My younger years were spent at a YMCA day camp, and my older years were at Camp Glisson, hiking and kayaking my way down the Appalachian Trail and miscellaneous rivers, sleeping under the stars and not showering for a week. (You wanna talk about stinky??) I recall one week spending as much time away from the group as possible, both on the river and on the trail, and doing some intense soul searching. These times away from home and my tv and other people really helped me grow up, and helped shape who I am as an adult.